writer and musician, born in Glasgow in 1979, currently based in Liverpool. Immediately upon graduating from the University of Glasgow in 2001, Rebecca’s first play Last Child was performed at the Arches Theatre in Glasgow (dir. Neil Doherty), subsequently at HERE Arts Center in NYC in 2002 (dir. Michele Travis). Her play Danger: Hollow Sidewalk was performed at the Arches Theatre in 2006 (dir. Neil Doherty). She has played the lever (Celtic) harp since she was a child, having heard it in Scottish traditional music. Rebecca moved to Liverpool in 2004 and began developing her solo work in music and spoken-word. 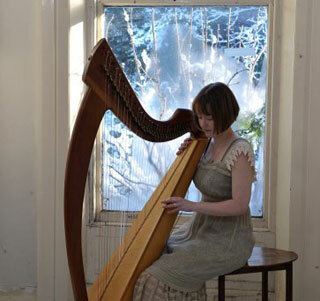 She made her first EP of harp compositions with spoken-word, The Mystery Workshop, in 2009. She frequently collaborates with other musicians, writers and artists in creating cross-disciplinary performances and projects, incorporating both her musical and written work. In 2008 she composed the harp score for Eleanor Rees’s long poem Eliza and the Bear, which is an ongoing performance project. As an Artist in Residence with Metal Liverpool (2009 – 2010), she wrote the text and score for her poetry performance, The Ballad of Juniper Davy and Sonny Lumière, first shown in Liverpool in May 2010. The text is published by Spike poetry press in Liverpool. The project incorporated performed poetry and live music, with visual installations by Elizabeth Willow. She has appeared as a guest on BBC Radio Merseyside and on BBC Radio 2’s The Verb. The Mystery Workshop (CD), Joy Recordings 2009, JR001.